Hi! This is Dorothy. As I prepare June's message, it is May 31, so just hours from a new month and, truth to tell, much later than I like, in fairness to Noel, who magically transfers these words onto my website. However, this morning I recalled how personally symbolic the date is. Not only is it the birthday of a long-time friend of my teenage years, but it has signified two major new beginnings. These were times when I reviewed my life, reflectively cocooned for a time, and then started again. 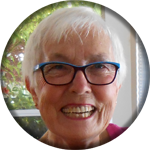 Mary Manin Morrissey produces a Daily Dream Builder email, which is an inspirational start to my day (www.MaryMorrissey.com). In one of her recent messages she referred to each new day as 'a lifetime in miniature'. This conjures up immense possibilities. It's a day that will never be repeated, and we get to choose our experiences. We get to write the script, dream new dreams, have a placid day or put lots of zip into it. Since reading Mary's description a few weeks ago, I've shifted my outlook to see each day as indeed a miniature lifetime. During May I also introduced a new concept into my morning reflective time. The suggestion came from a friend who had recently read The Joy of Appreciative Living by Jacqueline Kelm - which I have not read but is now on my booklist. The author's recommendation is to take five minutes and daily write down three things we appreciate (different each day) and one thing that would bring more joy. As well, once a week, for about thirty minutes, to write about our ideal life, with clarity. I share these ideas with you for your consideration. "For it is in listening to the music of the past that I can sing in the present and dance into the future." So do have a wonderful month. Live each day as a lifetime in miniature, appreciating your life, its richness, in preparation for dancing into the future. Again, you choose whether it will be a slow waltz or a tango. If I can support you with your journey, please do contact me.